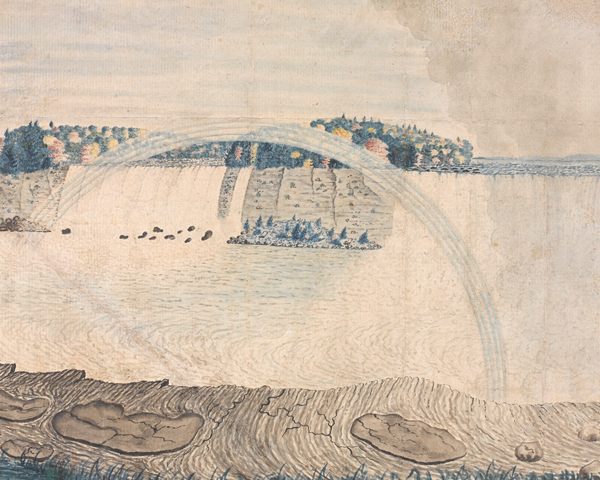 'An East View of the Great Cataract of Niagara' is an important watercolour documenting the struggle for control of North America. Painted in 1762 by Captain Thomas Davies, a military artist and surveyor, the work illuminates the history of British exploration, science and military enterprise. Thomas Davies’ view of Niagara is the first known eyewitness depiction of any part of the three waterfalls (or cataracts) situated at the southern end of the Niagara Gorge. The falls now sit on the border of the United States and Canada. But in the mid-18th century they were in French Canada or ‘New France’. Landscapes of North America from this period aren't common. The works of Davies' fellow British Army officers Hervey Smyth and Richard Short are among relatively few others. This view of Niagara is therefore rare and valuable for its topographical depiction alone. Davies’ watercolour depicts Horseshoe Falls - the largest of the three cataracts that collectively make up Niagara Falls - in panoramic form. The view is from the western shore of the Niagara River, looking across the falls towards Goat Island. Water vapour, referred to by Davies as ‘smoke’, rises from the cataract. And an ‘ever-present rainbow’ sits above it. 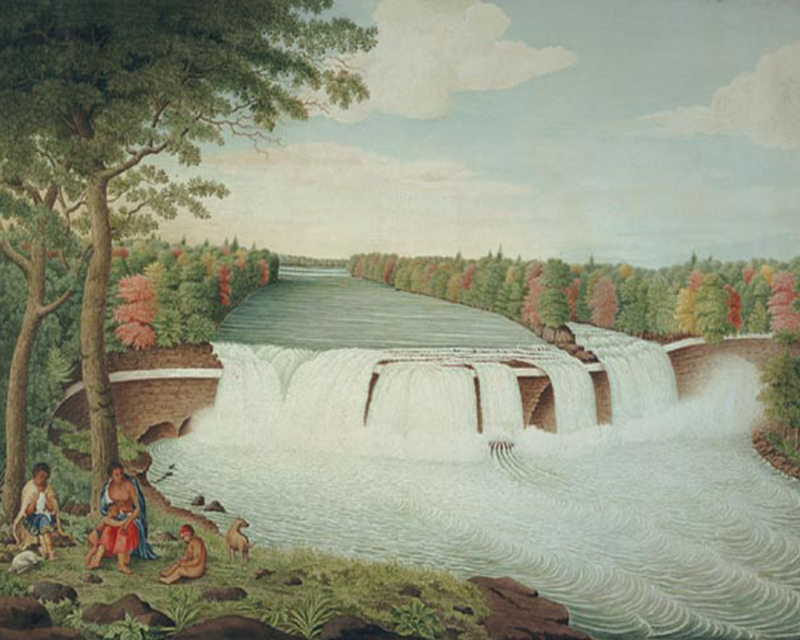 In the lower right, two Iroqouis tribesmen look across the falls in discussion as the figure to the left points to the distance. Davies takes the trouble to attempt an accurate depiction of the men’s clothing, jewellery, headdress and face-paint. Davies painted in situ, positioned near the present location of the Niagara Parkway. His work is the first life-like depiction of the local geography and flora. The surrounding countryside of the Niagara River Corridor is part of the Carolinian Forest. This area is noted for its spruce, birch, ash, elm, maple, oak and pine trees. And when viewed from Autumn onwards these species still clearly create a palette of greens, reds, oranges and yellows. Davies also notes ‘the perpendicular height of the fall 162 feet breadth about a mile and quarter’. This inclusion of measurements attests to the painting's purpose as military evidence. The falls were of strategic value in the struggle between Britain and France for control of North America. The area was vital for the transportation of furs, timber, food, trade goods and arms. All of this had to be man-handled over the Lewiston escarpment by hired local labour. The British knew access had to be improved for both strategic and commercial reasons. In the two years after this watercolour was produced (1762-64), Sir William Johnson built the first portage road, widening the indigenous foot trail into a wagon road. By doing so he rendered the native porters redundant, which didn't go down well with their tribe. Military engineer Captain John Montresor constructed new forts at Lake Ontario, Niagara and Lake Erie, as well as the first military tramway in North America. It was a gravity railway along the Niagara Portage, protected by a series of blockhouses along the route. Men and supplies could now be brought by vessel to the head of navigation at Lewiston, and from there, up the escarpment via the tramway. Thomas Davies (1737-1812) was born in Shooters Hill, London. He entered the Royal Military Academy Woolwich in 1755. It was there he first received instruction in military drawing under Gamaliel Massiot. In 1757 he became a second lieutenant in the Royal Artillery, eventually rising to the rank of lieutenant general. He exhibited at the Royal Academy and later became a fellow of the Royal Society. 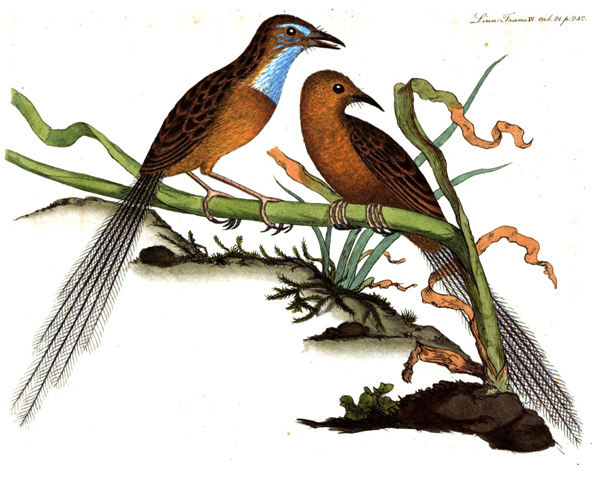 In addition to his works on topography, he produced several fine fauna and ornithological studies, including some of the earliest depictions of Australian birds. In 1757, Davies went to North America where he participated in the French and Indian War - the North American theatre of the Seven Years War (1756-63). During a failed expedition to capture the French Fortress of Louisbourg on Île Royale (Cape Breton Island), he produced a depiction of Halifax, Nova Scotia, and ‘The Construction of Fort Frederick’ (1758). He went on to record the Siege of Louisbourg in 1758, and the ‘Great Expulsion’ of the French Acadians. This was epitomised by ‘A View of the Plundering and Burning of the City of Grimross’, which dramatically depicts a city in flames. Davies remained in North America in 1759 and 1760, following General Jeffrey Amherst’s attacks on the forts at Ticonderoga and Crown Point. He took part in the Battle of the Thousand Islands in August 1760, during which Montreal was besieged and captured with the help of warriors from the Iroquois Confederacy. The Iroquois Confederacy, also known as the Iroquois League or Six Nations, was a powerful grouping of the Mohawk, Onondaga, Oneida, Cayuga, Seneca, and Tuscarora peoples. Their traditional lands stretched from south-eastern Canada down along the southern shores of the Great Lakes and past the Allegheny mountains into an area that incorporates the modern US states of Virginia, Kentucky, Ohio, and Indiana. This region heavily overlapped the territory in which France and Britain vied for power in North America. Following the British capture of Montreal in 1760, Davies began to spend much of his time travelling and surveying the Great Lakes region. He became familiar with both the territory and the Iroquois people. He produced several maps and artistic depictions of topography, including ‘An East View of the Great Cataract of Niagara’ and ‘A South East View of the Great Cataract on the Casconchiagon or Little Seneca’s River’, both in 1762. 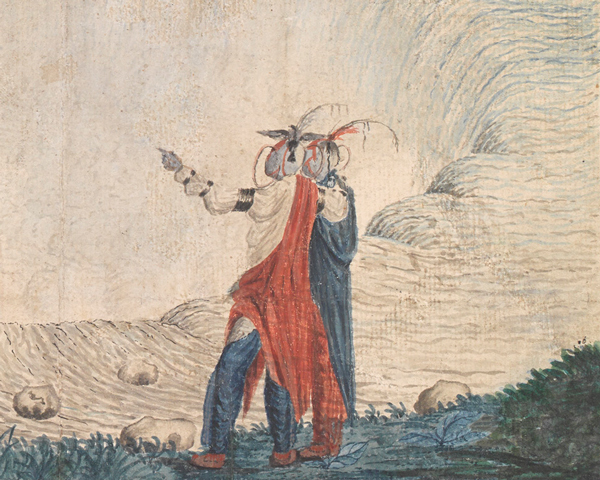 In the view of Niagara, two indigenous figures are seen in the lower right. And in the work of the Seneca Falls, two indigenous adults, two children and a pet dog are seen in the lower left. The inclusion of local people was likely to answer public curiosity about indigenous populations back in Europe, and to pay tribute to their important role in the conflict. The Iroquois were allies of the British during the war, and fought with them against the French and their Algonquian allies. 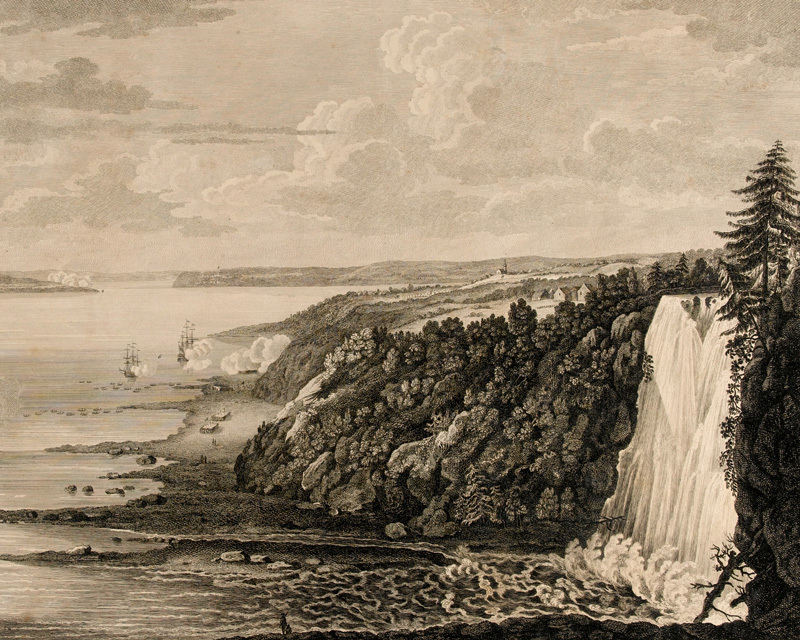 In 1766, Davies produced two further watercolours of the Niagara Falls, both now held by the New York Historical Society, entitled ‘Niagara Falls from Above’, and ‘Niagara Falls from Below’. These also featured the local populace in the foreground. Davies’ works represent an important progression in military surveying and drawing. Earlier military topographies and battle paintings were usually drawn in a diagrammatic fashion, the surrounding terrain and environment poorly detailed or neglected entirely. The main intention was showing disposition of forces, towns or defensive works. The influence of continental artists in the 16th to 18th centuries saw more detail and expression added to battle painting and topography. This allowed later commanders to study how environment and geography might affect the outcome of a battle, or better plan troop movements and accommodation. Military artists and surveyors were becoming vital to campaign planners. And men like Davies, whose pioneering work predates the creation of the Ordnance Survey (1791), were greatly influential in the progress of later military topographical works. 'A View of the Attack against Fort Washington and Rebel Redouts near New York' by Captain Thomas Davies, 1776. Davies’ works remain some of the most important visual representations of North America from the latter half of the 18th century. He would go on to depict the American Revolutionary War (1775-83), but it is his views produced in the 1760s which are most unique and impactful. As an artist, he did not content himself with depicting from afar. Instead he explored the territories he drew, getting to understand their environment and people. He exposed the natural beauty and highlighted the exotic. Although he advanced military survey and topography, he also wanted to bring life into his images. He saw himself not just as a surveyor, but as an artist. 'An East View of the Great Cataract of Niagara' (1762) was purchased with the generous assistance of the Art Fund and the Heritage Lottery Fund.